We're in a steamy antechamber in the heart of historic Istanbul. My hamamci, Fatih, has unfolded me on to the searing gobek tasi marble slab that fills the centre of the steam room. This is no dainty tourist massage. I'm battered flat like a wiener schnitzel. Fatih uses his elbows and forearms to exorcise the ghosts of winter from within me. The only respite from the marble furnace is when Fatih brings me a glass of iced mineral water. When he isn't looking, I dab some on my buttocks to ease the scald. I'm then lathered up like a soapsud snowman to scrub the toxins from my skin. 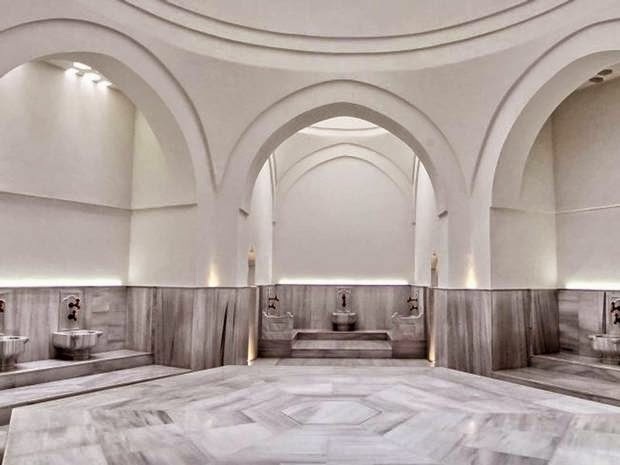 Despite appearances, this luxury bathhouse experience at the Ayasofya Hamami – opposite Istanbul's Aya Sofya Museum – has barely existed since the end of the days of the sultans a century ago. Like the English pub, the future of the Turkish hamam seemed bleak until recently. An entire generation of Turks preferred showers at home, and the idea of using a public bathhouse was deemed archaic. The Ayasofya Hamami was turned into a carpet showroom before being sympathetically renovated in 2008. Now, glass walkways display the original sit-in-a-row toilets and 15th-century furnaces. I'm part of a hamam revolution. And it feels hot. The hamam's splendour becomes apparent as Fatih settles me on to a divan in the reclining room. I'm swaddled in no less than five fluffy towels. An attendant brings tea and a silver box of Turkish delight. I sigh as the stress eases in my shoulders. I feel like a sultan after a busy morning drinking sherbet and executing people, and I drift into an easy sleep.